British Prime Minister Theresa May called for a further delay to Brexit beyond April 12 on Tuesday and said a "short extension" to Article 50 is needed. 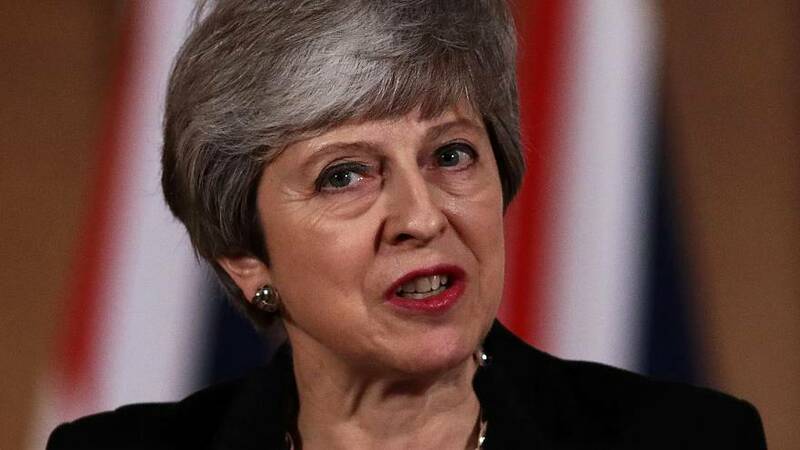 May said she understood some people are "so fed up with the delay" that they want to leave with no-deal but said the best option was to leave with one and wanted the process to be finished by May 22 so that the UK does not have to take part in the European Parliament election. The prime minister said she was "offering to sit down" with the leader of the opposition, Jeremy Corbyn, to agree a plan to break the political stalemate. But she said a deal must include her withdrawal agreement, which British MPs have previously rejected three times. “I am offering to sit down with the leader of the opposition and to try to agree on a plan - that we would both stick to - to ensure that we leave the European Union and that we do so with a deal,” she said. May's decision offers the prospect of keeping the UK more closely economically tied to the EU but it is a gamble as it risks division in her Conservative Party, as half her MPs want a clear split with the bloc. Any plan agreed with Corbyn would then be put forward to MPs to approve and would then be taken to the European Council meeting on April 10. Corbyn said he is he would be "very happy" to meet the prime minister and have those discussions that would allow for the UK to leave with a deal. He added he would hold a vote of no-confidence in the government in reserve if any eventual deal still failed to achieve a majority in parliament. However, if May and Corbyn do not agree on a way forward, then a series of options for the future relationship with the EU would be put to the Commons. The President of the European Council appeared to indicate he could be open to May's suggestion. In a Tweet, he wrote: "Even if, after today, we don't know what the end result will be, let is be patient." Guy Verhofstadt, Brexit coordinator for the European Parliament said the cross-party compromise was "better late than never". But the foreign ministers of Germany and France called for more clarity from the UK after May's comments. "I'm tempted to say let us know if something changes," said France's Jean-Yves Le Drian at a joint press conference the two held in New York. "Three years after their decision, the British must come up with a clear line because otherwise, sadly, it'll be a hard Brexit in coming days." German Foreign Minister Heiko Maas declined to comment on the request for an extension but urged London to move swiftly: "That we're long past five after midnight - they must know that in London, too." Boris Johnson, Britain's former foreign minister and a leading figure in the campaign to take Britain out of the EU during the 2016 referendum, said on Tuesday Brexit was becoming “soft to the point of disintegration”. “I think it’s very disappointing that the Brexit process has now been entrusted to Jeremy Corbyn and the Labour party, and I think that the result will almost certainly be, if Corbyn gets his way, that we remain in the customs union,” he told Sky News. The Democratic Unionist Party (DUP)m which props up May's government said in a statement: "Her announcement tonight comes as little surprise. Though it remains to be seen if sub-contracting out the future of Brexit to (Labour Party leader) Jeremy Corbyn, someone whom the Conservatives have demonised for four years, will end happily." May's comments come as Labour MP Yvette Cooper and a cross-party group of ministers are attempting to table a motion that would propose an extension to Article 50 to ensure the UK cannot leave the EU with no-deal by default. MPs are hoping the bill would go through to the House of Commons on Wednesday and would be debated by the House of Lords on Friday or Monday. The plan comes as the EU ramped up pressure on Tuesday and warned a no-deal Brexit looks increasingly likely. The EU's chief negotiator Michel Barnier said on Tuesday a no-deal Brexit is “very likely” and increasingly so by the day after the House of Commons rejected all the alternative solutions to Theresa May’s deal. France's President Emmanuel Macron also had strong words. He said the European Union will not be hostage to a "political crisis" in the UK, as he held talks with Irish Prime Minister Leo Varadkar.